The expansion of human knowledge requires that courts of law increasingly rely on expert witnesses, including medical expert witnesses, in their search for the truth. But as several recent cases have illustrated, the unfettered use of experts in judicial proceedings can have tragic consequences. In Ontario, the expert testimony of Dr. Charles Smith, a pediatric forensic pathologist, has been linked to several miscarriages of justice and resulted in an official inquiry conducted by Justice Stephen Goudge. In his report, Goudge identified several concerns regarding the interaction between medical expert witnesses and the justice system. 1 The medical community should be informed of these concerns, so that any physicians testifying as expert witnesses are aware of their proper role and can thus help to safeguard the integrity of the justice system. Today, the gap between a layperson’s knowledge and that of an expert is vast and growing in virtually all domains. It is vital to the pursuit of justice that the judge or jury have access to the specialized knowledge of experts when it is likely that such knowledge will be required to arrive at the truth. Expert witnesses undoubtedly play a vital role in the justice system, but that role must be strictly defined. In general, a strict dichotomy is observed between the role of witnesses and the role of the trier of fact. Witnesses testify to the bare facts (what they saw, heard, said, etc. ), whereas the trier of fact forms opinions and draws conclusions based on the witnesses’ testimony. As an exception to this general rule, expert witnesses are permitted to offer opinions because the law recognizes that judges and juries are not readily able to form opinions on some matters. Expert opinions are permitted in situations where someone with a layperson’s knowledge or experience is unlikely to reach the correct inference from the facts alone. 4,5 For instance, a toxicologist would be permitted to testify that symptoms observed in a patient seen in the emergency department were, in his opinion, consistent with poisoning. Second, the justice system’s pursuit of the truth is not absolute; it is attenuated where necessary to ensure fairness or to preserve the integrity of the administration of justice. In this regard, expert testimony brings to the fore two important issues. Notably, the high cost of retaining experts impedes equal access to justice and raises concerns about the fairness of the judicial system. 7,8 In addition, when litigants are able to parade experts advancing dubious pseudoscientific theories in front of the judge or jury, the administration of justice is brought into disrepute. This is also the case when a trial is allowed to devolve into a “battle of the experts,” with both sides presenting supposedly objective and irrefutable — but nevertheless conflicting — evidence. The third reason to control the use of experts is that courts are not particularly qualified to assess the reliability of an expert’s testimony. Lawyers and judges often lack even basic scientific literacy. 1,4 Furthermore, often a complex substratum of fact and theory underlies the expert’s opinion, and it can be difficult both for a lawyer to navigate through this information when challenging the witness during cross-examination and for the judge or jury to follow. Fourth, our justice system requires that the judge or jury resolve questions of fact, and there is often a fine line between aiding the fact-finder and usurping him or her. For example, a physician may testify to the applicable standard of care in a medical malpractice suit, but it would be impermissible for the physician to state a belief that the defendant was negligent, because this is a legal determination to be made by the judge or jury. The evidence must be relevant: it must tend to establish a fact in issue, and the value of the evidence must outweigh the costs of introducing it into the trial process. The evidence must be necessary to assist the judge or jury. Expert evidence is not permitted on matters about which laypersons are expected to be knowledgeable. The expert evidence must not be inadmissible on any other basis. Apart from the rule excluding opinion evidence, there are many other statutory and common law rules governing the admissibility of evidence. This third part of the test is simply to ensure that parties do not use expert witnesses to introduce, through the “back door,” evidence that would otherwise be inadmissible. In his report, Goudge expressed several concerns regarding the manner in which forensic pathologists interact with the justice system. Among his concerns were the following: the nature of the opinions given by forensic pathologists, the means by which pathologists substantiate their conclusions, the ways in which pathologists deliver their opinions and the expert witness’s general awareness of his or her role in the justice system. In some of the cases examined by the Inquiry, Smith’s testimony was challenged by experts retained by the defence. In others, it was not. In any event, Goudge’s concerns — which revolve around the intelligibility of an expert’s testimony to the parties, their lawyers, the judge and the jury — are operative in both situations (i.e., where testimony is rebutted by another expert and where it is not) and in civil proceedings as well. Lacking broad knowledge of an expert’s discipline, the court is ill-equipped to ensure that an expert stays within his or her area of expertise. For example, when Smith claimed that as a pediatric pathologist he was better situated than a certified forensic pathologist to diagnose stab wounds in children, the court accepted his claim, 1 because it seemed quite reasonable to someone outside the medical community. It is likewise difficult for the court to determine whether a scientific expert’s opinion is properly grounded in science. Scientific reports use technical terms that do not translate easily into everyday English. Lawyers and judges must grapple with this unfamiliar language, which can make the process of following the scientist’s logic very difficult. Furthermore, lawyers, judges and juries often lack the intuition for the scientific method that scientists develop through years of education and experience and are therefore less likely to identify weaknesses in an expert’s opinion. In addition, it is unclear what sort of reasoning is permissible. For instance, there is debate regarding the extent to which a pathologist may rely on circumstantial evidence 1 or his own experience in other cases 19 when forming conclusions about a person’s cause of death. Pathologists who testified before the Goudge Inquiry had differing opinions regarding how much reliance could be placed on circumstantial evidence. 1 While the Ontario Court of Appeal recently rejected a pathologist’s opinion that was based solely on his own experience and was not supported by peer-reviewed studies, 19 it is not clear that medical experts’ opinions must (or should) always be supported by a relevant body of scientific literature. Some might argue that the justice system should have the benefit of cutting-edge scientific knowledge as it develops, rather than waiting until it appears in scientific journals. With respect to Goudge’s third concern — the ways in which pathologists deliver their opinions — he found that Smith’s opinions were sometimes vulnerable to misinterpretation. For example, Smith used the term “asphyxia” without clarifying that he intended the benign scientific meaning, not the inculpatory meaning. 1 He was also sometimes unclear about his level of confidence in his opinion about the deceased’s cause of death. 1 Such testimony is problematic, according to Goudge, because participants in the justice system are continually distilling complex and nuanced opinions to make them intelligible for purposes of deliberation, 1 and ambiguous testimony makes this task much more difficult. Although it is vital that experts use straightforward language in their reports and testimony, 1 it is unclear how the law should ensure that they do so. Several commentators have suggested that, when the adversarial system is working as it should, our courts are a robust forum for highlighting matters of scientific controversy. 1,23,29 Goudge’s report is a tragic narrative of the mischief that results when the system is not functioning effectively. There is no one particular cure that will guarantee the integrity of the system. Relying on legal rules alone has proven ineffective. To function well, the system requires that judges, lawyers and expert witnesses all do their part. Lawyers should not take on cases that involve complex medical evidence unless they are scientifically literate. 1 Each time a party calls an expert witness to testify, the judge must carefully consider whether to “qualify” the expert on the basis of his or her expertise and the testimony he or she intends to give. 1,6 Judges must also remain vigilant once an expert takes the stand and must ensure that the expert does not stray from his or her area of expertise. 1 Finally, expert witnesses must give fair, objective and impartial testimony, irrespective of whether they have been retained by a party or appointed by the court. 1 They must also be sensitive to the vulnerabilities of the system and do their utmost to present evidence in a manner that ensures its intelligibility (Box 1). 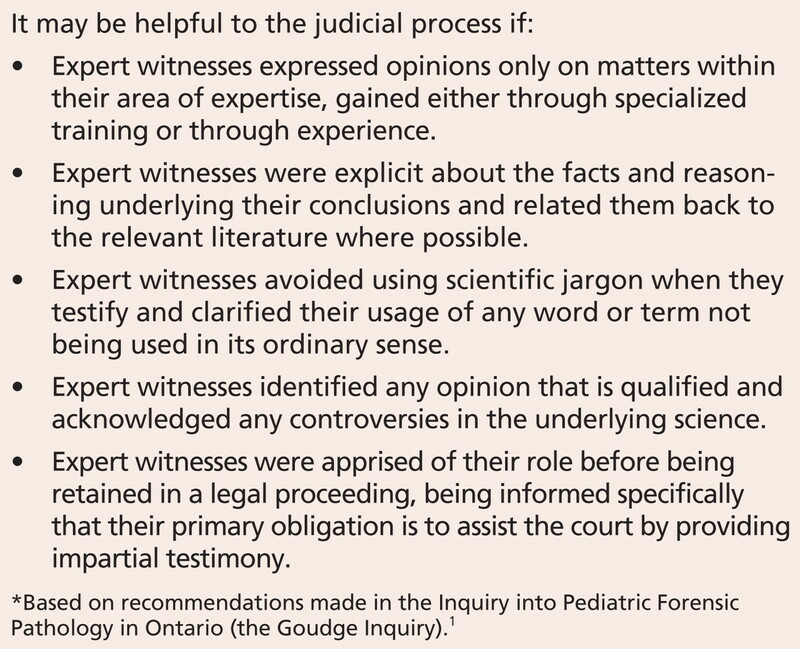 The Inquiry into Pediatric Forensic Pathology in Ontario (the Goudge Inquiry) concluded that interactions between medical expert witnesses and the justice system can be problematic. To prevent miscarriages of justice, the medical community needs to be aware of the expert witness’s role in the justice system and the challenges that expert testimony poses to the system. The expert’s role is to help the judge or jury reach the correct fact-based inference in cases where someone with only a layperson’s knowledge or experience is unlikely to make that inference. The overriding duty of any expert witness is to assist the court by providing impartial testimony, regardless of who retained the witness. Contributors: Both authors were responsible for the conception and design of the article and the analysis presented therein. Both authors were involved in drafting and revising the article for important intellectual content, and both read the final version to be published and approved its contents. Goudge ST. Inquiry into pediatric forensic pathology in Ontario. Toronto (ON): Ontario Ministry of the Attorney General; 2008. Landsmann S. The adversary system: a description and defense. Washington (DC): The American Enterprise Institute; 1984. Hand BL. Historical and practical considerations regarding expert testimony. Harv Law Rev 1901;15:40–58. Anderson GR. Expert evidence. Markham (ON): LexisNexis; 2005. R. v. Abbey,  2 SCR 24. Beecher-Monas E. Evaluating scientific evidence: an interdisciplinary framework for intellectual due process. New York (NY): Cambridge University Press; 2007. R. v. D.D.,  2 SCR 275. Osborne CA. Civil justice reform project: summary of findings and recommendations. Toronto (ON): Ontario Ministry of the Attorney General; 2007. Available: www.attorneygeneral.jus.gov.on.ca/english/about/pubs/cjrp (accessed 2009 Apr. 22). R. v. Mohan,  2 SCR 9. R. v. Marquard,  4 SCR 223. Taylor v. Liong,  BCJ No. 330. Wolfin v. Shaw (1998), 43 BCLR (3d) 190. R. v. Murrin (1999), 181 DLR (4th) 320. Daubert v. Merrell Dow Pharmaceuticals Inc., 509 US 579 (1993). R. v. J.-L.J.,  2 SCR 600. Driscoll M. His legacy of shattered lives. Sunday Times [London (UK)] 2004 Jan. 25. Available: www.timesonline.co.uk/tol/news/article1061437.ece (accessed 2009 Apr. 29). Archer G. The plot thickens in Keogh murder case. Independent Weekly [Adelaide (South Australia)] 2008 Nov. 4. Available: www.independentweekly.com.au/news/local/news/general/the-plot-thickens-in-keogh-murder-case/421286.aspx (accessed 2009 Apr. 29). Levs ML. Bite-mark evidence loses teeth. Am Bar Assoc J 2008;94:16. Available: www.abajournal.com/magazine/article/bite_mark_evidence_loses_teeth/ (accessed 2009 Nov. 23). Truscott (Re) (2007), 225 CCC (3d) 321 (Ont. CA). Gold AD. Expert evidence in criminal law: the scientific approach. Toronto (ON): Irwin; 2003. Consultation Memorandum 12.3: Expert evidence and independent medical examinations. In:Alberta Rules of Court Project. Edmonton (AB): Alberta Law Reform Institute; 2003. Available: www.law.ualberta.ca/alri/Publications/Consultation-Memoranda.php (accessed 2009 Apr. 24). Rt. Hon. Lord Woolf. Chapter 13: Expert evidence. In:Access to justice: final report to the Lord Chancellor on the civil justice system in England and Wales. London (UK): Department of Constitutional Affairs; 1996. Available: www.dca.gov.uk/civil/final/sec3c.htm#c13 (accessed 2009 Apr. 29). Edmond G. Secrets of the “Hot Tub”: expert witnesses, concurrent evidence and judge-led law reform in Australia. Civ Justice Q 2008;27:51–82. R. v. Harris and others,  EWCA Crim 1980. Criminal Procedure (Amendment No. 2) Rules 2006, S.I. 2006/2636, r. 19. Edmond G. After objectivity: expert evidence and procedural reform. Syd Law Rev 2003;25:131–63. Rules of Civil Procedure, amending Reg. 194 of R.R.O. 1990, O. Reg. 438/08, s. 48. Concept draft: proposed new rules of civil procedure of the British Columbia Supreme Court. Vancouver (BC): BC Justice Review Task Force; 2008. Available: www.bcjusticereviewforum.ca/civilrules/downloads/civilrules_conceptdraft_may2008.pdf (accessed 2009 Apr. 24). Jasanoff S. Science at the bar: law, science and technology in America. Cambridge (MA): Harvard University Press; 1995.